Apple held it’s annual spring event yesterday in Palo Alto to make iPhone, iPad, and iOS related announcements (amongst others). However, this year for a change the first executive invited to address the audience was Apple’s vice president of Environment, Policy and Social Initiatives, former EPA Administrator, Lisa Jackson. Lisa was greeted by warm applause which became more enthusiastic when she announced that 93% of Apple’s facilities worldwide are now powered by renewable energy. This means Apple is now well on its way to achieving its stated aim of being fully renewably powered globally. And in 23 countries, including the United States and China, Apple is already 100% renewably powered. In China Jackson explained, Apple has a 40MW solar farm which has a minimal impact on the local environment, and allows for the local Yak farmers to graze their animals and grow hay under the panels (seen above). This solar farm produces more electricity than Apple uses currently in all of China. Apple’s data centres are also fully renewably powered, and it has a policy of siting new data centres only if the site has access to renewable power. This was one of the reasons behind Apple’s choosing Ireland and Denmark for its two newest data centres last year. In fact, since hiring Jackson away from the EPA, Apple has made some extremely positive moves in reducing its footprint, and greatly increasing its transparency. This focus on transparency may go some of the way to explaining Apple’s decision last week to move a significant portion of its iCloud storage business away from notoriously opaque Amazon to Google (although, it is as likely to do with diversifying suppliers, moving to a supplier more in line with Apple’s views on data privacy, and possibly easing the transition to eventually self-hosting the data). Jackson also talked about Apple’s investments in forestry, and how Apple are using paper sourced from sustainably farmed forests for 99% of its packaging now. Apple is demonstrating tremendous leadership in the energy and sustainability space (as well as the privacy space, but that another story!). Kudos to them, and interestingly Amazon appears to be finally getting around to supplying some of its operations with renewable energy too – though, it still shuns any kind of auditing or reporting on its energy and emissions. Sigh, maybe someday after seeing Apple put their environmental initiatives front and centre, Amazon will also see the value of doing this. is in essence a European Blog search with a lovely trend function. We have some more cool stuff to come, will keep you in the loop. In the example above I looked for mentions of my name along with the terms Apple, Microsoft and Energy. 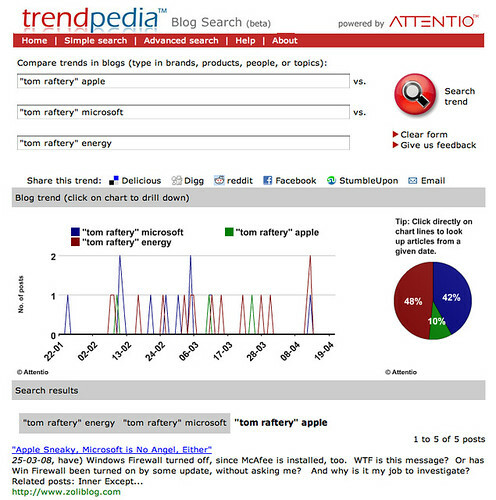 I was surprised by the high showing of Microsoft vs. Apple and interested to note the upward trend of the term Energy since I started my LowerFootprint.com blog. I can see lots of ways this can be improved (can anyone say widget?) but for a simple first off offering, I like what it does. Well done guys. Get off your high horse Ed! There was a big bruhaha on the intertubes over the weekend when Apple ran its software update on Windows and offered the Safari 3.1 browser download as the default selected option. Now I am not for a second condoning this kind of behaviour. I believe opt-in is the only way to do optional updates, especially when you are adding applications to a users machine. * Opt-in is the only way. The update process should be completely opt-in. The option to deliver software should never be preselected for the user. * Offer full disclosure. The software company has a responsibility to fully disclose what its software does, and the customer should make the opt-in decision only after being given complete details about how the update process works. * Offer updates only. Updates should be just that. They should apply only to software that the customer has already chosen to install. * Donâ€™t mix updates. Updates that are not critical should be delivered through a separate mechanism. They are good principles, I have no argument with them however Ed offers these principles up as if Microsoft lived by them! Ed, you are dreaming. Microsoft are just as guilty of breaching these principles as Apple. I don’t use Microsoft software much but the last time I tried to update Windows Live Writer my default search engine was changed to Live Search, and I had to opt out or I would have had Windows Live Mail, Windows Live Photo Gallery and Windows Live OneCare installed on my laptop. Microsoft Wireless Laser Keyboard 6000 not very wireless! I bought a Microsoft Wireless Laser Keyboard 6000 V2.0 a few weeks back because I needed an ergonomic keyboard (was suffering from an RSI) and went wireless to avoid cable clutter. However, I have had lots of issues with the reception on the wireless devices. They report poor signal quality when 2-3 centimeters apart! 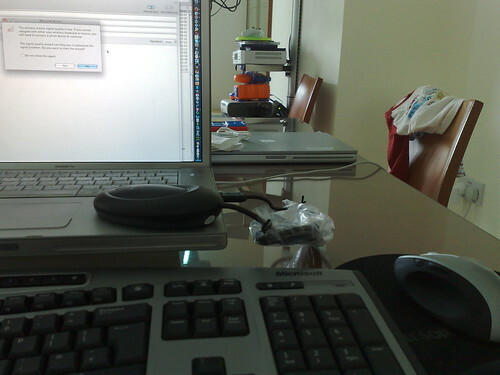 How hard can it be to get a keyboard and mouse working wirelessly? Apple have been doing this properly for ages. Of course Apple use Bluetooth instead of some bloody proprietary wired dongle which doesn’t work, takes up a USB port and adds a large cable to your desktop! I was bemused then to note today that Microsoft are bringing out the Wireless Laser Keyboard 7000. It has a glass border around the keyboard to maintain the Vista Aero branding. I only hope they remember to get the wireless part functioning this time! With Apple’s move to Intel chips for its Macs, the last significant difference in the hardware architecture between Macs and PCs disappeared. This meant that Apple’s much vaunted OS X operating system is designed to work on PC hardware. Leopard, Apple’s latest version of OS X was released on Friday 26th last and in just over 24 hours, a hack to allow Leopard to be installed on PCs has been published. The installation is not trivial but the instructions are very easy to follow and it certainly looks do-able. No doubt Apple will quickly release an update (10.5.1) which will address this but in the meantime, all you non-Mac users, enjoy a secure, reliable, easy to use OS on your choice of Intel-based hardware. I have Vista installed on this laptop. I haven’t booted up Vista in weeks. Why? Because I installed Ubuntu on another partition and it is so much faster, and more secure (since Microsoft instructed me to remove Norton and then failed to get OneCare to work on this laptop). Many others are eschewing Vista, not just because of the speed and stability issues it has but also because of the steep learning curve on moving from XP to Vista. Apple shipped 2,164,000 MacintoshÂ® computers, representing 34 percent growth over the year-ago quarter and exceeding the previous quarterly record for MacÂ® shipments by 400,000. The Company sold 10,200,000 iPods during the quarter, representing 17 percent growth over the year-ago quarter. Quarterly iPhoneâ„¢ sales were 1,119,000, bringing cumulative fiscal 2007 sales to 1,389,000.
â€œApple ended the fiscal year with $15.4 billion in cash and no debt,â€ said Peter Oppenheimer, Appleâ€™s CFO. Why are Apple’s Mac sales doing so well and Vista so poorly? Apple introduced OS X in 2001 and since then has brought out four newer versions (Puma, Jaguar, Panther, and Tiger) with a fifth version (Leopard – OS X 10.5) due to ship this coming Friday. Ubuntu releases new versions on a pre-defined six monthly schedule. Xp was also released in 2001 but the next version of Windows, Vista, didn’t ship until January 2007. The gently, gently upgrade strategy appears to be working for Apple and Ubuntu as their uptake soars. Microsoft needs a new strategy for its Windows platform. Its current strategy certainly isn’t working. Is Mac OS X Leopard's Mail App Junk? Om Malik is taking a poll on his site today about the new features in OS X Leopard. He is asking readers to say which of the new features will compel them to move to Leopard. Om’s own choice is Apple’s Mail app. Personally I used Mail for years and loved it but I had to drop it eventually in favor of Thunderbird because its junk mail filters are useless. I kept clicking on the Junk button to try to train it to learn what was junk from what wasn’t but Thunderbird was orders of magnitude better at stopping spam so I had to move away from it. Reading that there is a new version of Mail in Leopard I quickly checked out its new features but I was disappointed to see no mention of improved junk mail filtering. I spotted an article in the Financial Times last night which said Apple has succeeded in persuading 3 mobile operators to sell the iPhone in Europe using the same revenue share as AT&T in the US. Damn! I realise it is unlikely but is there any chance the UK O2 launch will include Ireland? You wait for ages then along come three! I have read a lot about how great the iPhone is but I hadn’t seen any until last Friday; and then I saw three! I was at a lunch in Cork with Britt Blaser and Sean O’Mahoney (amongst others). Both had iPhones. I had a chance to try the phone out for myself and see just why people rave about it. It is spectacular. Later that day I met Patrick Collison. Patrick also had an iPhone. He was meeting Damien and myself. During the meeting he had to leave us briefly to collect someone. He left his iPhone for us to play with. It really is an incredible phone (although Patrick, after about 25 minutes the sound deteriorates on calls to the speaking clock in Hong Kong 😉 ). 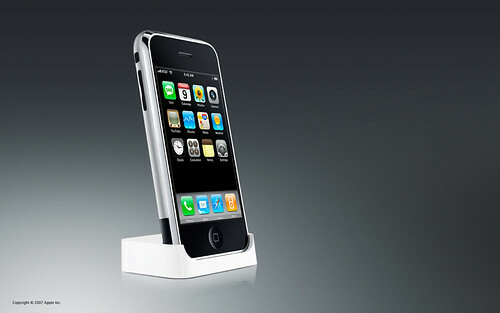 There is no question but that Apple have re-defined the mobile phone. Forbes Madrid are reporting this morning that O2’s parent company, Telefonica have signed an exclusive deal with Apple for iPhone distribution rights in the UK. This is the second time this rumour has emerged in the last two weeks. Both times from very credible sources. It makes sense. Vodafone don’t need Apple (and the sales boost iPhone exclusivity would give them) as much as O2 does. This deal obviously doesn’t stop Apple signing deals with Vodafone in other European countries. I’ll be interested to see who gets distributorship in Ireland!